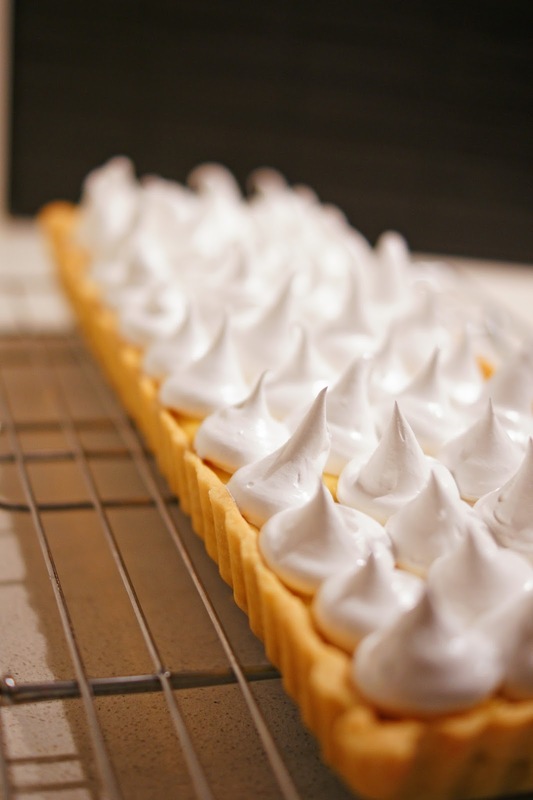 When I used to make it back in my Uni days though, the filling would be one large part condensed milk and while the meringue was easy to make, doing the old fashioned way (i.e. whipped stiff peak egg whites + gradual pour of sugar method), I always found that the resulting meringue would weep within a few hours and then the next day, the pie would look a bit worse for wear in the fridge. 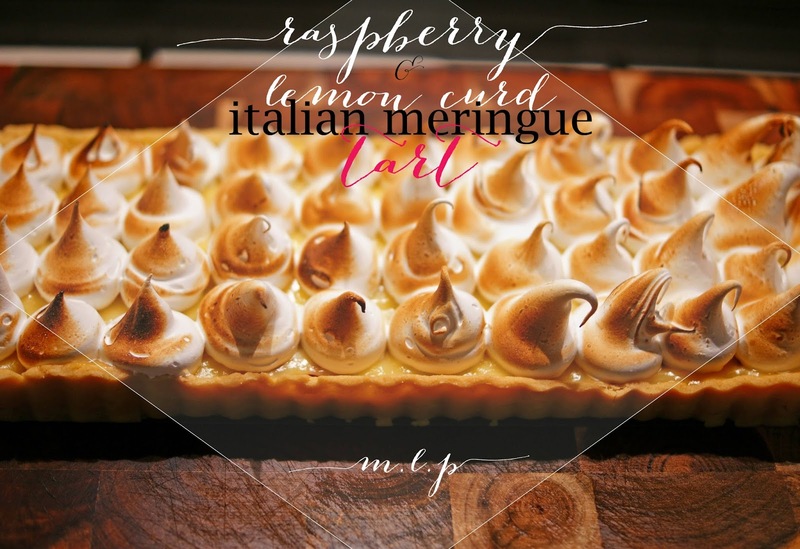 The Italian meringue method I used for this tart however, yielded a much sturdier peak with no meringue tears in sight. And these days, while I do like my pies and cakes, I lean towards more balanced tasting desserts, and adding in some divine summer fruit like Raspberry gives just the right tarty balance to this tart ;) I followed a recipe from the recent Spring/Summer issue of the Donna Hay magazine, but used my large rectangular fluted tart tin (you can use 6 round fluted tart tins if you wish), and also piped out the meringue like little gnome heads! 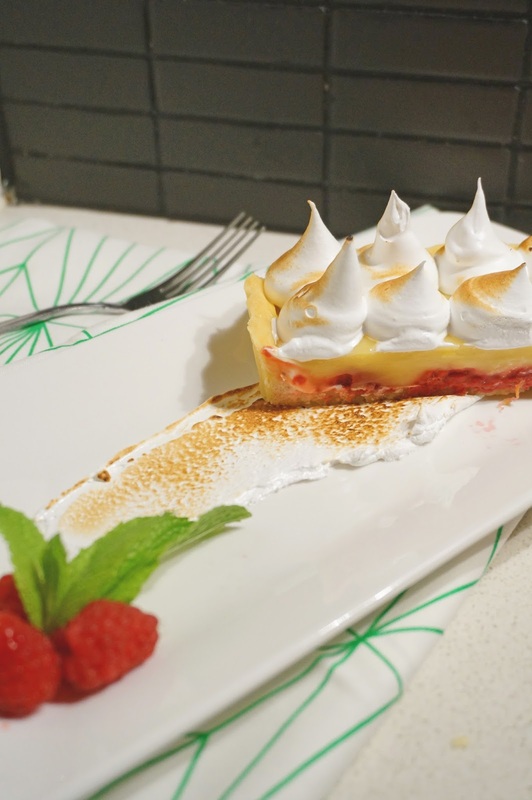 There are a few steps to this recipe, including prep time , baking time, and refrigeration time, so be sure to read through all the steps first before figuring out whether you have time to make this! 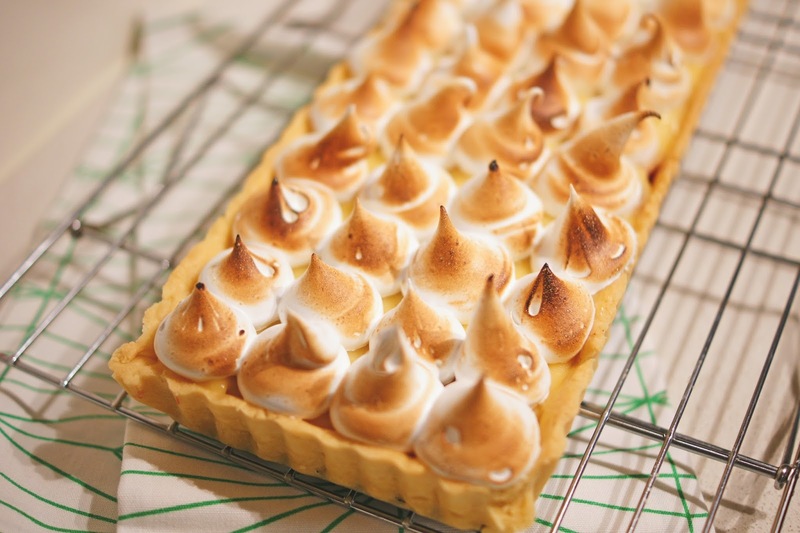 Of course you can make the short crust pastry and lemon curd ahead of time (like a night or two before) and then just make the meringue the day of, and assemble it altogether before taking it to a friend's place or serving to your loved ones! (1) Place the flour, butter and icing sugar in a food processor (I used my KitchenAid standing mixer with the whisk attachment), and process until the mixture resembles fine breadcrumbs. (2) Whilst the motor is running, add the egg yolks and cold water, and watch as the breadcrumbs come together like a dough. (3) Turn the dough onto a lightly floured surface (floured with plain flour or icing sugar) and gently bring it together to form a ball then flatten it to a disc. Cover in plastic wrap and refrigerate for 30 mins (or 20 mins in the freezer), or until firm. (4) Preheat oven to 160 Degrees Celsius (325 Degrees Fahrenheit). Take your dough out of the fridge and wait for 5-10 mins until the dough is roll-able to about 1.5mm thickness. 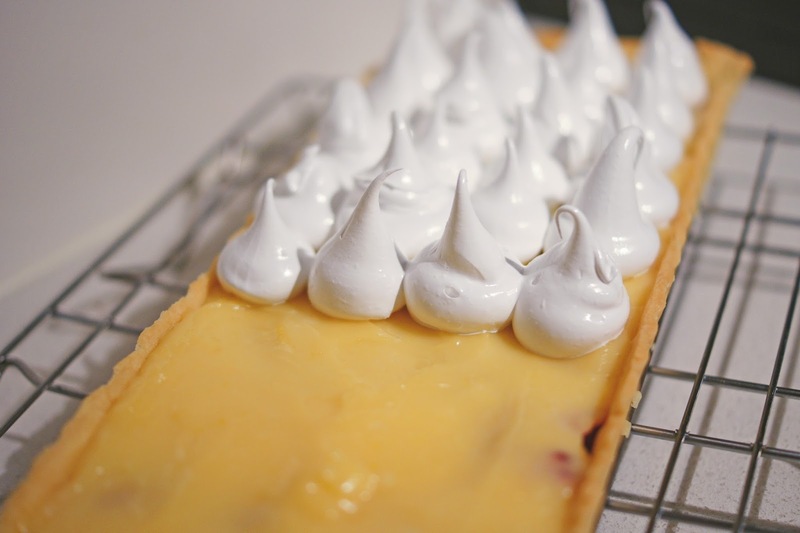 Place this dough onto your greased tart tin, press down into the tin and the fluted edges and then trim off all the excess dough sitting over the edge. Place this in the fridge to firm up for 8 minutes. (1) Place 1 cup of the milk into a medium saucepan, and place the sugar as well. Place over high heat, stirring until the sugar has dissolved. (2) In a separate mixing bowl, place the cornflour and the remaining milk and whisk together. Then add this cornflour mixture to the milk mixture. (3) Reduce heat to medium, add butter to the saucepan mixture and whisk until melted and combined. (4) Add lemon juice, zest and egg yolks and continue cooking and whisking until the mixture is thickened like a custard texture, then take off heat. (5) Crush the raspberries and spread over the cooled pastry case. (6) While lemon curd mixture is hot, pour it over the raspberries and smooth the surface with a palette knife. (7) Place the filled pastry case in the fridge for 30 minutes. (2) Meanwhile place the egg whites and cream of tartar (or lemon juice) in an electric mixer/standing mixer and whisk until soft peaks form. (3) Whilst the motor is running on the electric mixer, add the sugar syrup in a thin steady stream into the egg whites. Continue to whisk until the mixing bowl feels cool (be careful because the metal bowl can get really hot!). 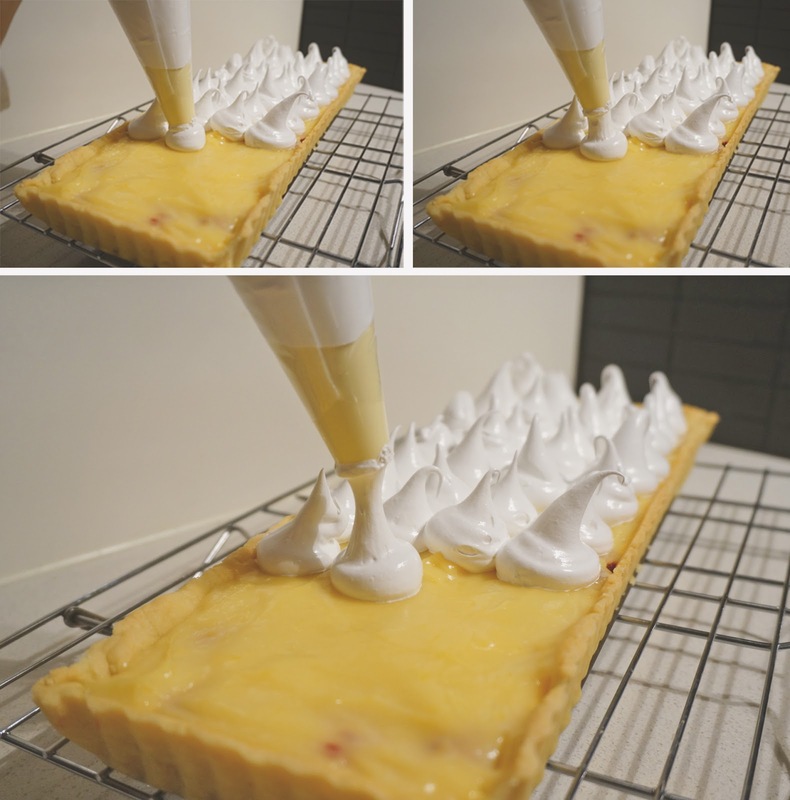 (4) Spoon the glossy mixture onto the pie(s) (or pipe them out like I did) over the lemon curd and using a kitchen blow torch, lightly torch the surfaces until golden flecks form. p.s. 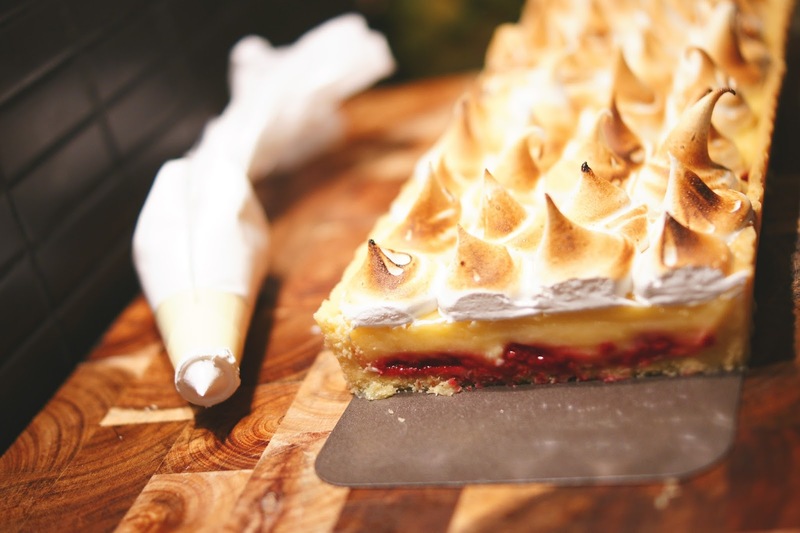 a quick meringue dessert here and another pie dessert here.